Offensive Player of the Year: Shandon Hopeau, Kapolei, midfielder, Sr. The numbers do not lie in the case of Shandon Hopeau. The Kapolei senior midfielder/forward was simply masterful on the pitch this season and that translated to 33 goals for Hopeau and the first-ever appearance in a state championship match for the Hurricanes. Hopeau led the entire state in goals scored, finishing with five more goals than Kalani's Takahiro Kosins. He scored a goal in 12 of Kapolei's 17 games this year. On nine occasions he scored multiple goals in a game, including a season-high nine goals against Campbell on Jan. 7. "He's a very dynamic player with incredible one-on-one skills and is a guy that is tough to contain, especially on the dribble," Mid-Pacific coach Jayson Abe said. "He's a very smart player and is able to get the guys around him playing at a higher level. He's someone that defenses always had to be mindful of because he always finds a way to find the back of the net and I think that's one of the true characteristics of a true striker." Hopeau scored nine goals in postseason play, including all three goals in a quarterfinal-round win over Moanalua in the Oahu Interscholastic Association tournament. He had five goals in the state tournament and was named to the all-tournament team. "I think that he was very vital to Kapolei because he was their playmaker and the leader of the team," Pearl City coach Randy Shinn said. "It was his play that really allowed Kapolei to get where they did this year. Every (opposing) coach knew that Shandon was their go-to player, but he still produced all year. I don't think Kapolei would have had the year they did without him." It is the second straight year that Hopeau received First Team All-Hawaii recognition. He was selected as OIA Western Division Player of the Year by league coaches this season. "He has an uncanny ability to read the game," Shinn said. "Even with two, three, four people around him he still has the ability to distribute the ball or beat people one-on-one and not only that, but finish. The other captains they had were more vocal — he's more of a silent leader — but his actions tended to do it all for them." Hopeau plans to pursue a professional soccer career in Croatia after graduating from high school this May. Defensive Player of the Year: Tyler Ohata, Punahou, goalkeeper, Sr.
To put it simply, Tyler Ohata was a wall for the Punahou boys soccer team this season. The senior goalkeeper played a pivotal part in the Buffanblu's run to their 13th state title in school history last month. He allowed only four goals all year and posted 12 shutouts. Punahou went undefeated on the season with a 12-0-3 record. During one stretch, Ohata did not allow a goal in six consecutive games — a period of five weeks. "He's an amazing keeper," Mid-Pacific coach Jayson Abe said. "He was the best defensive player in the state, by far. I think he provided a lot of stability and provided that Punahou defense with a lot of confidence in the back with his leadership and his calm demeanor and I think that allowed the rest of the defense to play a little bit more loose and with more confidence knowing that they had a solid keeper." Ohata gave up just two goals during the ILH season — one of them in a 1-1 tie against Mid-Pacific. The other time the teams met resulted in a scoreless tie, which Ohata certainly had his hand in. "We played (Punahou) in our last regular season game in the ILH and there are two saves in particular that stick out in my mind from that game," Abe said. "There was one in the first half where one of our midfielders struck the ball hard and I don't think (Ohata) saw it until the last season and he just made a reflect save and prevented a goal. Then in the last five minutes he just makes this incredible save. Against average-to-good keepers, both of those are goals." 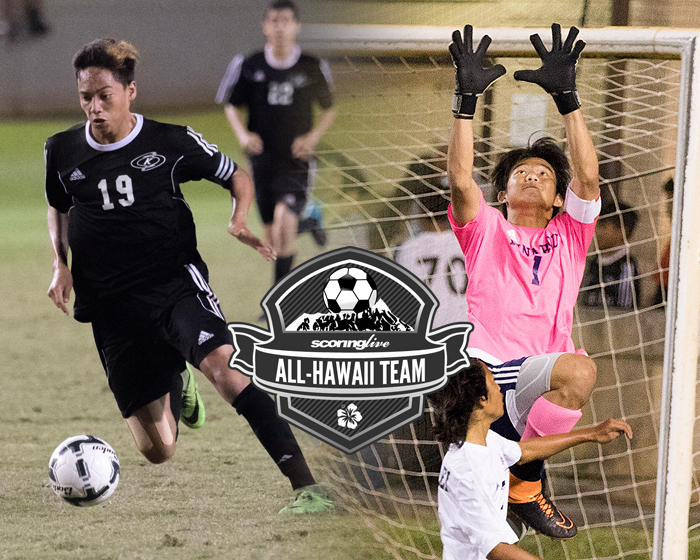 Ohata, who stands 6-feet tall, was named to the Interscholastic League of Honolulu's First Team in a vote of league coaches. He posted a pair of shutouts in Punahou's final two games of the year: a 2-0 semifinal win over Kamehameha-Maui — which was coming off of a four-goal game one day earlier — and a 2-0 victory over Kapolei and the state's leading scorer in Shandon Hopeau in the title game. "In the event that things didn't work out, they had a guy that can cover them and make those plays," Abe said of Ohata and the Buffanblu defense. "He was able to produce and make those big time saves in big time games and moments." Ohata was selected by the Hawaii High School Athletic Association and members of the media as the most outstanding player of the state tournament. One of the biggest upsets of the soccer season occurred on Feb. 9 when Radford — the fifth seed out of the Western Division — went to Mililani and came away with a 2-1 win in overtime over the defending state champions to lock up a state-tournament berth. The Rams were, by most accounts, the surprise team of the postseason after a fifth-place finish in the Oahu Interscholastic Association D1 West. They posted a 1-0 first-round win at Kahuku just one day prior to upending the Trojans. Radford, under longtime coach Geoff Maeda, ended up finishing third in the league tournament and reached the quarterfinal round of the Division I state tournament. "They crept up on a lot of teams and they had a great showing in the state tournament as well," Mid-Pacific coach Jayson Abe said of the Rams. "They caught a lot of people off guard. I don't think there were a lot of people expecting Radford to be there and I don't think there were a lot of people expecting Radford to do so well, so obviously he did something right." Maeda's squad went 6-4 in the regular season and 10-7 overall. After an 0-3 start to the year, it won eight of its next nine games, including five consecutive victories. "I think he did a tremendous job overall," Pearl City coach Randy Shinn said. "Coming from Radford, where you have players transferring every single year, throughout the year, he did a great job bringing the boys together this year. They peaked at the right time. He's a hard worker from what I've seen and he has the program going in the right direction."